The Red Hot Lindy Hop lesson and session continues this Friday night at the Rumba Room with free admission and lesson before 7:00 p.m., and $5 cover at the door afterwards. The lesson will be by Michelle and Jaredan and music by Bethany. Dress like you are going out! Live music at the Hop next week with the New Memphis Hepcats. Today's Sunrise Serenade was "Buttons And Bows" by Dinah Shore. Click on the song title to listen courtesy of Jazz On Line. Is it the end of July already? I might as well start getting out the Christmas decorations. Fortunately, the end of the month did not surprise The Hollywood Revue, which once again provides a preview of the monthly schedule on TCM. 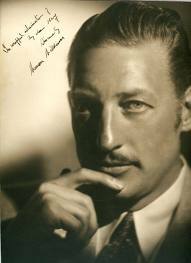 August is "Summer Under The Stars" month, and some of this year's honorees include Myrna Loy, Ginger Rogers, James Cagney, Warren William (the original Perry Mason and Lone Wolf - pictured), and Tyrone Power. This morning's Sunrise Serenade was "Beyond The Blue Horizon" by Martha Tilton & Her V Disc Playfellows. In this YouTube video, we see what appears to be an actual V Disc being played, as well as a great listening set up. Summer means baseball, so here is a great summertime cartoon, and one of my all time favorites. From the Internet Archive, here is the Warner Bros. animated short, Baseball Bugs. Today's Sunrise Serenade was "Benny Rides Again" by Benny Goodman and His Orchestra. Click on the song title to listen courtesy of Jazz On Line. It seems like a while since I posted some good, old-fashioned pulp fiction covers, and Golden Age Comic Books Stories comes to the rescue with 18 fantasy and science fiction titles from 1947 to 1952. The artwork on these covers literally out of this world, and one of these days, I must read some of these stories. 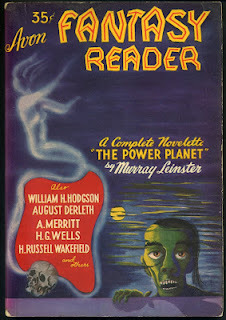 Authors included A. Merrit, H. G. Wells, H. P. Lovecraft and the late Ray Bradbury. The playlist for the July 25, 2012 broadcast of the Swing Shift Shuffle has just been added to the playlist filing cabinet. 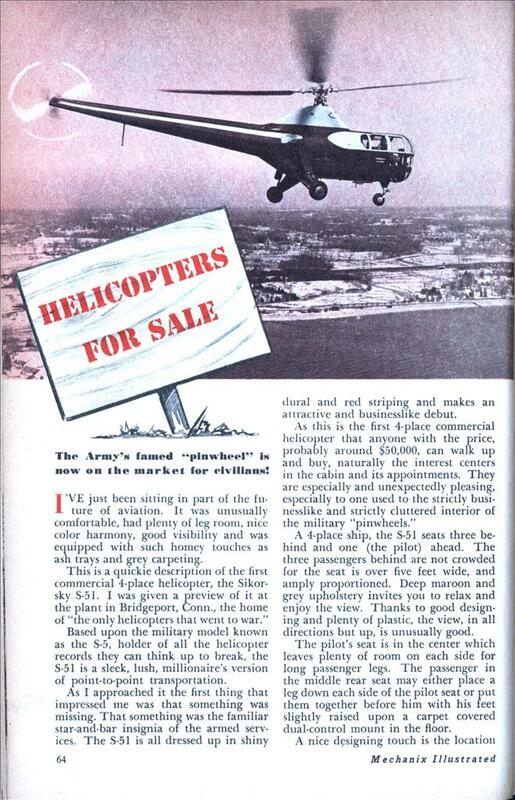 The first practical helicopters were built by the Sikorsky company, and began flying for the U.S. military during World War II. 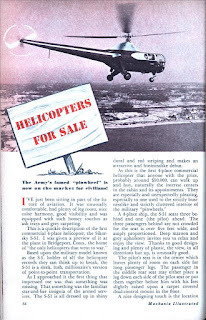 This article from the June 1946 edition of Mechanix Illustrated, posted on Modern Mechanix, examines the company's attempts to break into the civilian market. It reads much like a test drive article from an automotive magazine, as the author describes the appointments of this relatively new mode of transport. This morning's Sunrise Serenade was "Coney Island Washboard" by the Mills Brothers. Click on the song title to listen courtesy of Jazz On Line. The Red Hot Lindy Hop lesson and session continues this Friday night at the Rumba Room with free admission and lesson before 7:00 p.m., and $5 cover at the door afterwards. The lesson will be by Michael and Annabel with music by Michael. Dress like you are going out! Today's Sunrise Serenade was "Sweet Georgia Brown" by Harry James and His Orchestra. Click on the song title to listen courtesy of Jazz On Line. Over 25 years before Chevy and Ford produced the El Camino and Ranchero respectively, Studebaker created the Coupe Express by combining the front end of a passenger car with the bed of a truck. The Jalopy Journal has a brief history of the model. I have seen one or two Coupe Expresses, and they are impressive, not to mention rare, vehicles. Today's Sunrise Serenade was "Angeline" by Cab Calloway and His Orchestra. Click on the song title to listen courtesy of Jazz On Line. 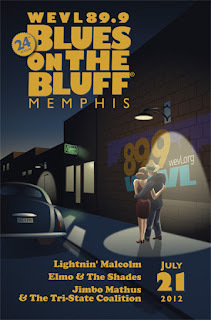 WEVL's Blues on the Bluff Tomorrow Night! I have been remiss in failing to remind you about Blues on the Bluff® tomorrow night, July 21. In addition to being a great party, Blues on the Bluff is an important fundraiser for WEVL, without which there would be no Swing Shift Shuffle. So come on down to the river for great time and a great cause. Bring your chairs and blankets and celebrate 24 years of fun on the bluffs of the Mississippi River in a beautiful, park-like setting. Giant shady oaks, cool river breeze, fantastic music, the smell of BBQ, cold drinks, and absolutely the best view of the Mississippi in the entire mid-south! WEVL's 24th Annual Blues on the Bluff® features an outstanding line-up of music: Elmo & The Shades, with original Memphis soul men from Stax and Hi Records; electric blues and rock from Mississippi's Jimbo Mathus and his band The Tri-State Defenders; and North Mississippi Hill Country blues fused with modern sounds from Lightnin' Malcolm with blues icon Junior Kimbrough's grandson Marquell on drums. Alcoholic* and non-alcoholic drinks sold, plus award-winning BBQ (veggie, too) from Central BBQ. Schlafly Beer is our official beer sponsor. No coolers or pets, please. Come prepared to bid on dozens of fabulous items in our Silent Auction! WEVL T-shirts, posters, and other merchandise also be sold. Gate opens at 6:00 p.m. and the party goes on until 11:00. $20 admission at the gate, $10 kids 11 and under. FREE guarded parking. All proceeds go to WEVL FM 89.9. Visit wevl.org for more info, directions, and to buy discounted advance tickets through July 20 at 11:59 p.m. The 24th Annual WEVL Blues on the Bluff® is sponsored in part by FedEx. And...don't forget to vote for WEVL as Best FM Station in the Memphis Flyer Readers Poll. Be sure to read the rules carefully so your ballot isn't disqualified. Deadline to vote is July 29 at 11:59 p.m. Vote now! Thanks for your support and we hope to see you Saturday night! We head west this week with this 1950 MGM short featuring everyone's favorite pugilistic pair, Tom and Jerry. From the Internet Archive, here is Texas Tom. This morning's Sunrise Serenade was "Murder, He Says" by Teddy Powell and His Orchestra with Peggy Mann on vocals. Enjoy the YouTube video below. This image of Veronica Lake, posted on Film Noir Photos, tells an interesting story of how a change in hairstyle helped the war effort. The government took this issue very seriously. There is a scene in the 1943 film Swing Shift Masie in which a somewhat "flighty" woman war worker (not the title character, played by Ann Sothern) who is too concerned with appearance to put up her hair falls victim to the mixture of long locks and moving machinery. The movie is a comedy, so no serious injury! For a video of Ms. Lake changing her famous hairstyle, check out this post from July 2010. Today's Sunrise Serenade was "Darling Nellie Gray" by the Golden Gate Quartet. Click on the song title to listen courtesy of Jazz On Line. The playlist for the July 18, 2012 broadcast of the Swing Shift Shuffle has just been added to the playlist filing cabinet. I was flattered when Retronaut published my submission of vintage Memphis postcards back in October, and now it has returned to the Bluff City with a series of color photos of Memphis in 1944. 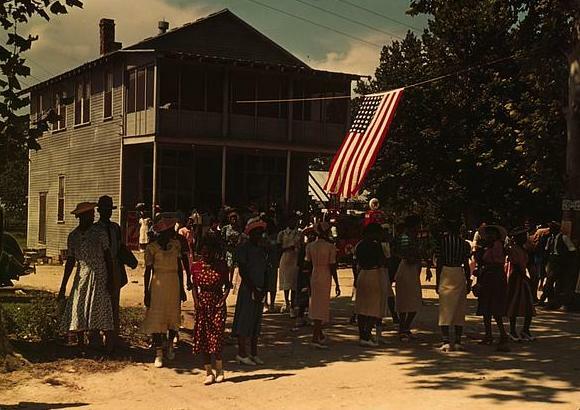 Some of the comments suggest that the top photograph is not actually Memphis, but Louisville. I am not certain. The suspect photo is certainly not Beale Street (or Avenue, as it was then), but other than the words "Louisville Rubber Store" under one sign, I cannot identify anything as unique to either City. "Louisville Rubber" could refer to a product, rather than a location. 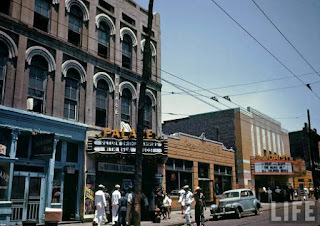 The buildings are similar to those on certain parts of Main Street, and none of the businesses would have been out of place in Memphis. This morning's Sunrise Serenade was "Undecided" by Django Reinhardt with Beryl Davis on vocals. Enjoy the YouTube video below. A Cool Cat And A Red Hot Hop - Venue Change! The Red Hot Lindy Hop lesson and session changes venues this Friday night to the Madison Dance Studio with free admission and lesson before 7:00 p.m., and $5 cover at the door afterwards. The lesson will be by Mike T and Becky with music by Becky. Dress like you are going out! "Steampunk" is a science fiction/fantasy genre in which steam provides the primary motive power for the technology of the story. Victorian Britain is a common setting for such tales. In this article from the March 1941 issue of Popular Mechanics, posted on Modern Mechanix, we learn that the importance of steam was fact, not fiction, just before World War II. One of the commenters to the post stated that he/she works for a company that still produces steam turbines, and the basic design has not changed since the 1940's. Today's Sunrise Serenade was "A Kiss To Build A Dream On" by Louis Armstrong. Click on the song title to listen courtesy of Jazz On Line. This short seems appropriate for Friday the 13th. Mr. Bang's doctor prescribes some rest and relaxation at the beach to calm his nerves, so he hops the Toonerville Trolley to the seashore. It does not end well. I've seen one or two Toonerville Trolley cartoons, but this is the first one I've seen that is in color. From the Internet Archive, here is the 1936 Van Beuren Studios cartoon, Toonerville Picnic. This morning's Sunrise Serenade was "Buds Won't Bud" by Judy Garland. Enjoy the video below from YouTube. During World War II, a large portion of the American manufacturing sector converted to war production. Car factories built tanks, nylon hosery companies made parachutes, and telephone equipment manufacturers made military communications equipment. The conversion did not stop advertising, however, because the businesses knew people could and would start buying again when the war was over. Demonstrating a company's contribution to the war effort was great salesmanship. Vintage Ads posted this Western Electric ad from an August 1945 issue of Life magazine. Today's Sunrise Serenade was "Doctor, Lawyer, Indian Chief" by Hoagy Carmichael. Click on the song title for a sample from emusic, or click here for the album page. The playlist for the July 11, 2012 broadcast of the Swing Shift Shuffle has just been added to the playlist filing cabinet. Once again, Pappy's Golden Age Comics Blogzine provides us with a comic book character that is exactly what you imagine a golden age hero to be. 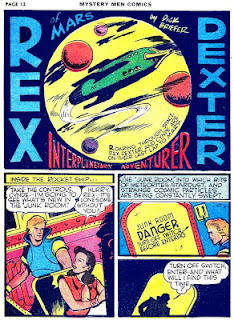 Rex Dexter is in the Buck Rogers/Flash Gordon vein, and in this story battles an alien villain that transforms humans into animals and then hunts them as punishment for humans hunting animals. This morning's Sunrise Serenade was "A Dreamer's Holiday" by Bing Corsby and Ella Fitzgerald. Click on the song title for a sample from emusic, or click here for the album page. 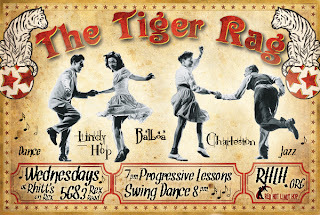 The Red Hot Lindy Hop lesson and session continues this Friday night at the Rumba Room with free admission and lesson before 7:00 p.m., and $5 cover at the door afterwards. The lesson will be by Jaredan and Kimmie with music by Jaredan. Dress like you are going out! Today's Sunrise Serenade was the "Dipsy Doodle" by the Golden Gate Quartet. Click on the song title for a sample from emusic, or click here for the album page. This blog focuses on the Swing Era, which for purposes of my own personal convenience, I arbitrarily designated as the period from 1930 through 1950. As a result, for the most part, there are no posts about topics from say, either 1928 or 1952. This limitation means that I forego posting about a lot of great retro subjects on the web. This self-imposed prohibition has, until now, included a star forever linked to the 1950's: Marilyn Monroe. Thanks to Life magazine, however, Miss Monroe can now grace the SSS with her presence. 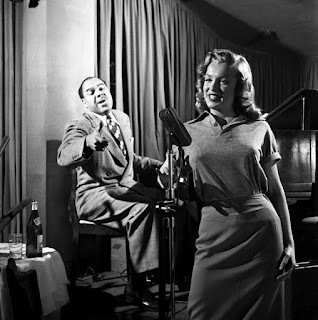 These unpublished Life photos from 1949 show an essentially unknown 22 year old Marilyn Monroe as she studies acting, dancing and singing to further her then very new career. 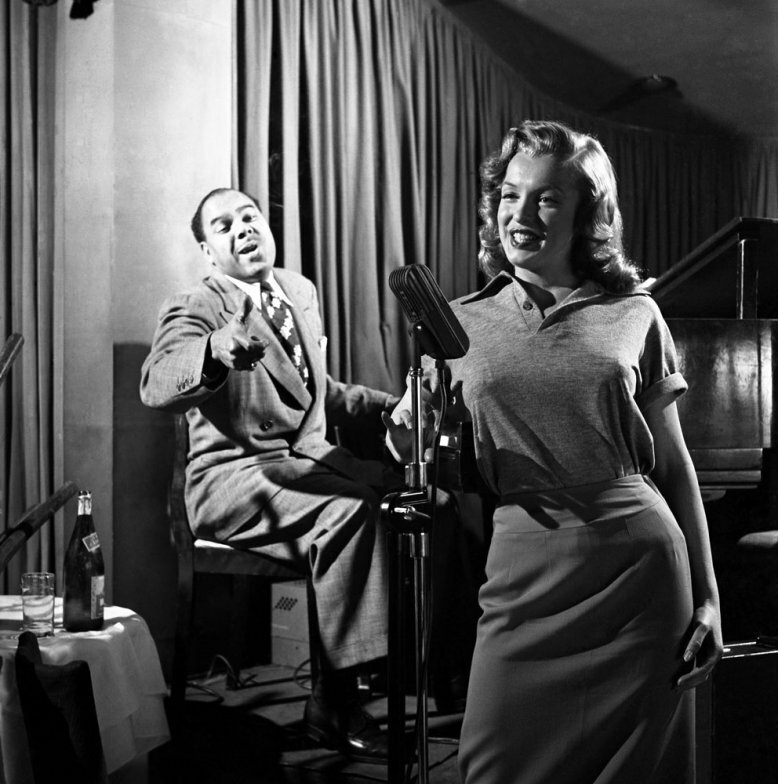 Here she takes singing lessons with "Phil Moore at the famous West Hollywood nightclub, the Mocambo, in 1949." Taking a slightly different animated track today, we feature an early work by Ray Harryhausen, he of King Kong and other stop-motion animated classics. In this short, Harryhausen does a few Mother Goose nursery rhymes. From the Internet Archive, here is the 1946 stop-motion animated film, Mother Goose Stories. Today's Sunrise Serenade was "Bell Bottom Trousers" by Kay Kyser and His Orchestra. Click on the song title to listen courtesy of Jazz On Line. There was a nice article in The Commercial Appeal yesterday about the Memphis Jazz Orchestra celebrating its 20th anniversary. 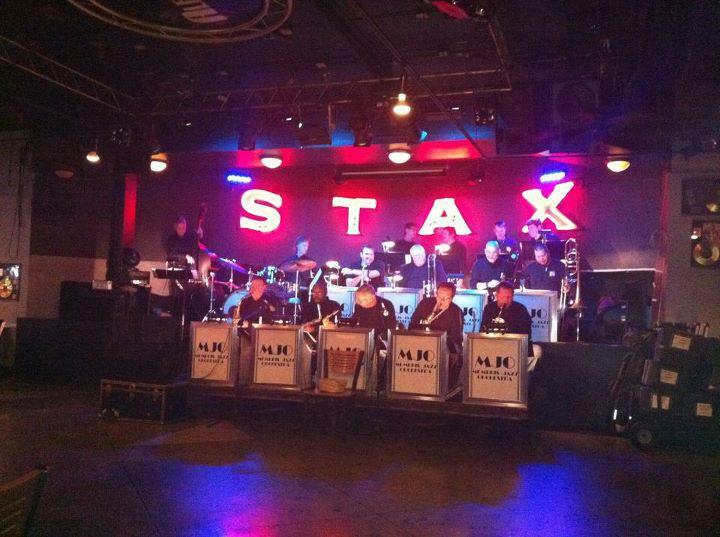 The MJO plays every Sunday night at Alfred's on Beale from 6:00 p.m. to 9:00 p.m. The playlist for the July 4, 2012 broadcast of the Swing Shift Shuffle Independence Day Special has just been added to the playlist filing cabinet. Happy Independence Day! Fourth of July Special Tonight! I hope everyone has a happy and safe Independence Day! My suggestion is to follow the example of these folks celebrating the Fourth of July on St. Helena Island, South Carolina in 1939: stay in the shade! 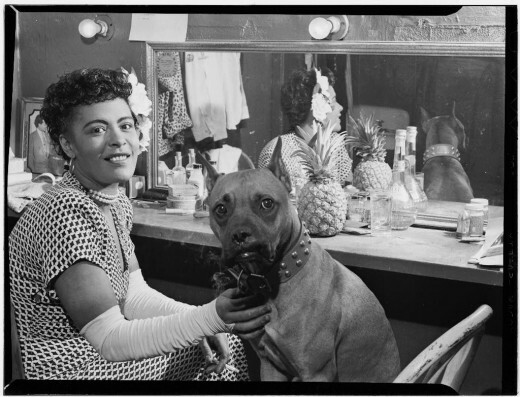 Photo from the Library of Congress American Memory Collection. Speaking of staying in, don't miss tonight's Swing Shift Shuffle Independence Day Special, featuring two hours of great patriotic swing! 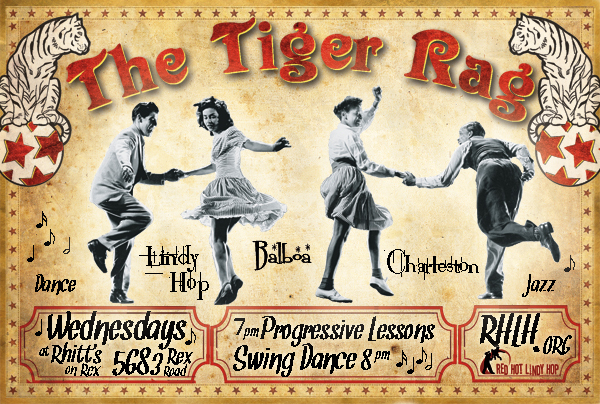 The Tiger Rag takes a break tomorrow to celebrate Independence Day, but a new 4 week class of Lindy Hop starts July 11. More info here. This morning's Sunrise Serenade was "Old Mother Hubbard" by Ella Fitzgerald. Click on the song title to listen courtesy of Jazz On Line. Retronaut tapped into the Library of Congress Gottlieb collection for a series of portraits of Billie Holiday from the late 1940's. I especially like the dog. This morning's Sunrise Serenade was "Tiger Rag" by Louis Armstrong and His Orchestra. Click on the song title to listen courtesy of Jazz On Line.